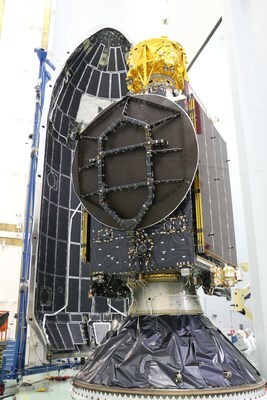 PALO ALTO, CA, Feb. 22, 2019 /PRNewswire/ - SSL, a Maxar Technologies company (NYSE: MAXR) (TSX: MAXR), and a leading provider of innovative satellites and spacecraft systems, announced today the Nusantara Satu communications satellite, built for Indonesian satellite operator PT Pasifik Satelit Nusantara (PSN), is successfully performing post-launch maneuvers according to plan. It launched last night aboard a Falcon 9 rocket from the SpaceX launch base in Cape Canaveral, Fla., and deployed its solar arrays on schedule. Tomorrow its main thruster will begin to propel the satellite toward its final orbit at 146 degrees East longitude. Nusantara Satu is a multi-mission satellite that includes Indonesia's first High Throughput Satellite (HTS) payload. Previously called PSN VI, the satellite will also provide voice, data and video distribution service throughout South East Asia. PSN is the first private satellite telecommunications company in Indonesia and a leading Asian provider of a full range of satellite-based telecommunication services. Nusantara Satu is also one of the first satellites to use SSL's next-generation electric propulsion system, which provides increased power, flexibility and performance, backed by a long heritage of electric propulsion success. An integral part of Indonesia's infrastructure, Nusantara Satu furnishes the most remote islands and villages with reliable, broad-based and affordable broadband to fuel economic growth and opportunity in the region. In addition the satellite's C-band and Ku-band transponders will be used for voice and data communications and video distribution throughout the Indonesian archipelago. "This mission demonstrates the success of SSL's advanced technologies and how we deliver business benefits to our satellite operator customers, which in turn will provide services that improve quality of life in the region," said Dario Zamarian, Group President, SSL. "We provided exceptional value to PSN by procuring the SpaceX Falcon 9 launch and partnering with Spaceflight and SpaceX to integrate additional missions. This marks the first time that our powerful electric propulsion system will provide orbit raising for both the primary satellite and a small tag-along mission." In addition to the satellite for PSN, SSL collaborated with rideshare provider Spaceflight to aggregate additional payloads that will accompany Nusantara Satu to orbit. This includes an experimental small spacecraft for the Air Force Research Laboratory that will deploy near GEO, and a spacecraft for SpaceIL that is the world's first privately funded lunar lander. "SSL has been a collaborative partner in helping us make Nusantara Satu a success," said Adi Rahman Adiwoso, Chief Executive Officer of PSN. "SSL is a leader in broadband satellites and has designed and built a next-gen spacecraft solution that will advance our aspiration to improve lives and create new opportunities for economic growth in remote regions of Indonesia."